Kick out the jams with hot licks and fantastic riffs on rock and roll from the only kind of fiction that feeds the soul: science fiction and fantasy. 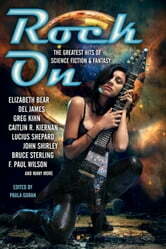 Like rock, speculative fiction is larger than life, there's no limit on where it can take you. And neither is—even now—fully respectable. Electrifying stories with the drive, the emotion, the soul of rock. Headliners and rising stars take the stage with their greatest hits. Find a place, grab some space . . . get ready to rock!